The High Street isn't dead, the boss of department store chain John Lewis has said ahead of its 50th shop opening. The new shop comes amid a shopping slowdown that has seen a host of big businesses shut stores or go bust. 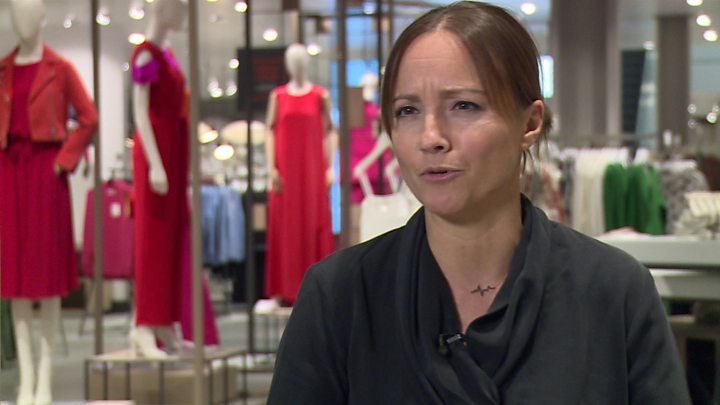 Paula Nickolds said there was "still a role for shops", but what customers wanted from them was changing. The opening comes after John Lewis Group reported earlier this month that profit had fallen by over a fifth last year. Ms Nickolds said shops had to offer experiences and services to stand out amid low consumer confidence and competition from online-only retailers. Its new store at the Westfield shopping centre in White City west London will offer experiences online rivals such as Amazon cannot offer such as fashion style talks, cookery classes and beauty treatments. It will also have an "experience desk" offering customers consultations on things from home design to travel advice. All 500 of the shop's staff have had theatre training from the National Theatre to help them offer better customer service. In its annual results, John Lewis chairman Sir Charlie Mayfield said 2017 had been a "challenging year", as expected, with "subdued" consumer demand. Ms Nickolds said the weaker profits reflected the "tough conditions" for retailers and that whilst consumers were continuing to shop they were being "more savvy" about what they bought. On Monday aCarpetright became the latest chain reported to be on the verge of seeking a company voluntary arrangement (CVA), which would allow to it to shut loss-making stores and secure deep discounts on rental costs. Fashion chain New Look recently did a similar deal, while earlier this month Mothercare said it was in talks with its banks after poor trading put it at risk of breaching the terms of its loans. Last week, Toys R Us said it would close all of its UK stores after the chain collapsed into administration in February, and electronics retailer Maplin also went bust. Ms Nickolds said retailers had to "adapt to survive" in the current climate. She said the changes at its new store reflected "the way that shops are moving from being a fulfilment destination to being somewhere where you experience a brand". This meant, she said, that customers may research a purchase in store, but order online from home, for example. As a result, she said the new store's success wouldn't be judged by sales figures alone. "How you judge the performance of an individual channel has to be much more sophisticated than it's been in the past," she said. Currently the chain is only planning one further store opening, but Ms Nickolds insisted the chain remained committed to shops. "We believe in the future of shops, customers still want to go out and have a day out with friends and family and connect with people on a human level," she said. Ms Nickolds took the helm of the retailer last year after Andy Street quit to become the mayor of the West Midlands. She is the first female managing director of John Lewis, having worked her way up the ranks as a graduate trainee.